In an earlier post I talked about how I had been doing ice skating lessons. The object was to move into Ice hockey at some point. I have been doing the Intro to Ice Hockey programme at the Ice house in Melbourne (www.icehouse.com.au). It is supposed to be a “from zero to hero” programme over 10 weeks. I have enjoyed this much more than just the ice skating classes. I really don’t have any need to know how to do advanced figure skating things. Puck handling, checking and of course scoring is what I’m interested in! I have always been a big fan of the NHL and my team the Anaheim Ducks. But since starting ice skating I have become much more interested and involved. I’d love to travel back to Anaheim and go to a Ducks game at Honda Center. The into to ice hockey programme has been great way to get into a sport that is not well supported here in Australia. It is a very steep learning curve to go from useless at skating to ice hockey hero. The programme is run by some players from the Melbourne Ice organisation headed by defensive player Matt Armstrong who is a Canadian import and forward Tommy Powell. It takes 5 weeks of skating before we actually get a stick or any protective equipment other than the gloves and helmet. This helps to get us to concentrate on actually skating properly rather than stuffing around with the stick and puck. I was ok at most things apart from crossovers, backwards skating and hockey stopping on my left foot. After week 5 we got to put on the equipment and grab a stick. That was interesting and felt quite strange when we first went out on the ice. Suddenly with a stick in my hand and some extra bulk I was useless (or more useless) at skating again. This is what we were here for though so it didn’t take long to get into it. I think my puck handling skills are better than my skating skills I just now need to be able to skate fast enough so I can actually get the puck! Falling over is actually more like fun with the pads on. With this in mind; me and a friend ordered some stuff online. 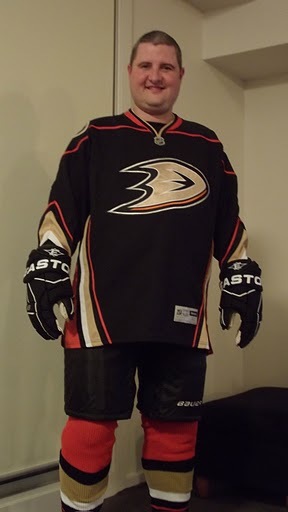 I now basically have an Anaheim ducks uniform minus shoulder and elbow pads, a helmet and a stick. I can’t wait to try them out on the ice. We are going to be doing casual lessons at Oakleigh this semester starting Friday so I’m looking forward to it.